This ONE OF A KIND retreat is perfect for those with discriminating taste and a desire for high quality. And it's a great romantic getaway. A winning combination of location, quality and price! Why stay in a hotel/motel, or the suburbs that look like any other? There are over 100 1BR/1BA vacation rentals in the 'Santa Barbara Area' and of these, 77 are supposed to be in 'Santa Barbara'. So how do you chose - location, location, location! And then compare our quality and price. The Beach Penthouse resides in a historical turn of the century building and retains the charm of the day’s bygone. It has been lovingly restored to reflect Santa Barbara's style including hand cast plaster, 10 feet vaulted ceilings and Waterford fireplace giving it both a romantic and European feeling. The large and private terrace has mountain views, along with dining table and chairs, chaise lounges and stainless steel BBQ to enjoy the local favorites. The fully equipped kitchen was designed with high quality construction, including granite countertops, limestone flooring and custom cabinets from our own local cabinet makers and are complimented with high end appliances: Sub-Zero refrigerator, Espresso Machine, stove, oven, dishwasher, microwave and washer and dryer. The living room has mountain and City sky line views along with queen size pull out couch, 42” TV, CD and stereo. The bedroom offers a queen bed and across the hall is the accompanying full bathroom that offers a romantic limestone shower with dual head shower, limestone floors, granite counter tops and custom Santa Barbara style cabinets. When you book with us, you are booking with the owners, which means you are not dealing with a management company, or a 3rd party call center, or a computerized mobile application. Often times the 3rd party does not live in town or even know the property. We know our properties intimately, as we both own and manage them, and have a 15 year track record. Our thirteen five star reviews speak for themselves, including our cleanliness. Upon booking, directions are emailed along with our contact information, Restaurant Recommendations, Winery and Activities Recommendations and Welcome Notes providing detailed information about the Penthouse are also provided. In this way, you can drive right to the Penthouse, which has a lock box where you’ll use your unique code to enter. There is no need to set up an appointment. Inside, you'll enjoy premium amenities: shampoo, soaps, paper & cleaning products and 5 star quality towels, linens and cleaniness. We welcome a comparison to the 100+ vacation rentals and Hotels as we are unmatched in location, quality and price! We own and manage our own properties which is different than most of the vacation rental properties that are managed. With our hands on approach we provide attention to both the property and to our guests for which we rely upon our overwhelming majority of repeat return business. 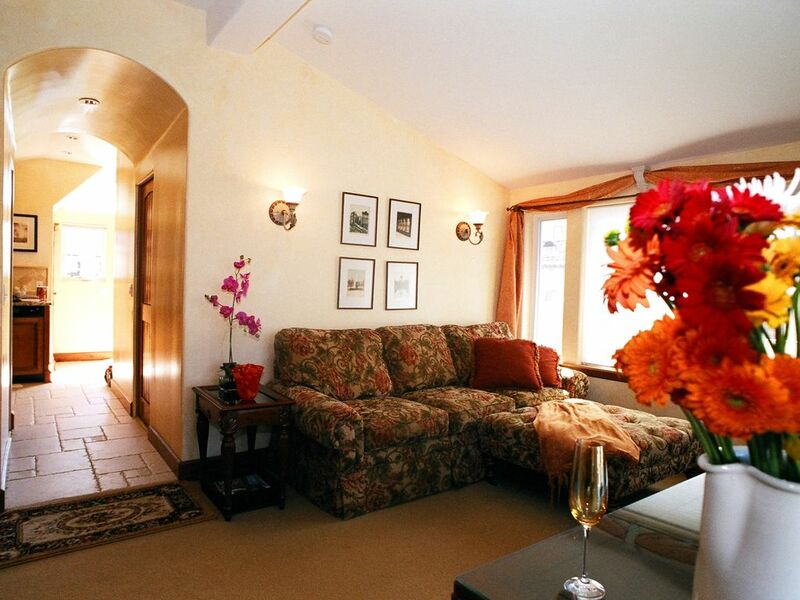 There are so many Santa Barbara properties available for rent. The number one difference between all of them are location, location, location. The closer to the beach and the closer to Santa Barbara the more expensive the real estate. We are 2 blocks to the beach and downtown, not on a commercial thorough fare, not next to the highway or railroad track and not a bus ride or car ride away from downtown. We combine our location with the best pricing and the best amenities. Finally, we are immaculately clean. Santa Barbara Athletic Club is a 5 minute walk and they offer temporary memberships. Call them to inquire for a deal. Private reserved parking, large private deck with City Skyline and mountain views, chaise lounges, table and chairs and gas grill. Best location in town - the Historic West Beach Area - in a Historical building. Thank you, Melanie this little get away was perfect as was your home. We will definitely return. Your condo was very comfortable and quiet, we felt very safe. We were also able to go on our balcony and watch the red moon, which was spectacular. Thank you again!! This is our second time renting this exact unit and love staying here. The rooftop has a fun outdoor space with a grill and table and chairs to hang out. Reserved parking space so you can avoid complicated Santa Barbara street parking rules.Location is close to State Street and the beach. Apartment is the perfect size for a couple and has the best shower ever! Perfect location to walk to the beach or into town or the Funk Zone. Traveled with another couple and we each had our own comfortable apartment in a nice residential neighborhood. It was an easy walk to restaurants, shopping, groceries, breweries and wine tasting rooms and the beach. The farmers’ market on Saturday was an easy walk and we were able to get lots of fun food for grilling on the deck. Detailed instructions on everything in the apartment were provided. The place was clean, bed comfortable, and everything was in working order. We hope to come again soon. Plenty of room, quiet and great location. Would highly recommend this property to anyone. We love this awesome pad and have always appreciated the great owners. We'd highly recommend this property for value, location, ambience and owner responsiveness.